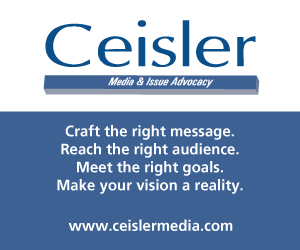 HERSHEY- The Pennsylvania Democratic Party’s spring meeting contained two very clear messages while they gathered to endorse two Superior Court candidates. Support women candidates and criticize President Donald Trump along the way. This morning, three candidates entered the meeting seeking the state party endorsement, while two walked away with this goal. The party recommended Philadelphia Court of Common Pleas Judge Dan McCaffery and former Allegheny County Councilwoman Amanda Green-Hawkins on the first ballot. McCaffery racked up 269 votes, while Green-Hawkins captured 229 votes. McCaffery, brother of former state Supreme Court Justice Seamus McCaffery, said he was glad to receive the party endorsement, but stressed that the work was far from over. 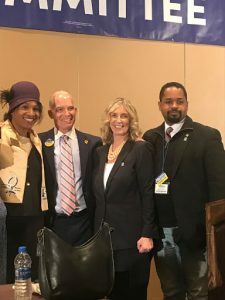 Green-Hawkins, who also served as one of the 19 superdelegates from Pennsylvania in 2016 and as a DNC committeewoman during the Obama administration, was introduced on the floor by Auditor General Eugene DePasquale, who is serving as the finance chair for her campaign. She thanked the party for the endorsement, but first laid out the symbolism behind her wardrobe for the day. She mentioned how her 14 aunts grew up in the segregated south and would wear crowns when they went to church, pointing to the hat she was wearing. She also wore a yellow shirt that says “Sisters of Steel” that symbolize her support for the United Steelworkers for America. Coming in third place was Beth Tarasi, an attorney from Allegheny County, with 83 votes. There were 18 abstention votes as well. Ryan James, a criminal trial and appellate lawyer from Allegheny County, received enough signatures to be on the ballot in May, but ended his campaign this morning before the endorsement process. A spokesperson for his campaign said that he endorsed Green-Hawkins and McCaffery before the endorsement vote. The night prior included fiery speeches from a number of individuals who believe the path towards sustained success revolve around boosting women seeking office and painting President Donald Trump’s policies and actions as a threat to the country. DNC Vice Chair Michael Blake, keynote speaker of the evening, told Democrats the time to be silent was over and if the party was to continue momentum from the 2018 election, it was needed to continue to call out Trump’s administration. Blake’s address was just hours after the reports that Special Counsel Robert Mueller’s investigation was completed. Initial reports indicate that Mueller will not be issuing additional indictments, but Blake believes that Trump is not in the clear yet. “There’s a reason that things have been going to other outlets such as the Southern District. There’s a reason why in New York right now we’re actually addressing a double jeopardy law….,” Blake continued. Rep. Madeleine Dean (D-Montgomery), who serves on the House Judiciary Committee, thanked Mueller for finishing the report, but urged that the report be made public. Dean attacked Trump for defying “every norm of decency, civility and respect,” but lauded the work that Congressional Democrats have done thus far and believes more progress will be made as they remain in the majority, specifically citing gun control. Dean, one of the four Democratic women breaking Pennsylvania’s all male Congressional delegation in 2018, believes the historic number of women elected to office in 2018 will help continue to propel the party forward. 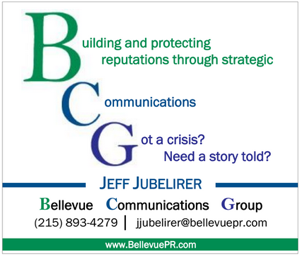 The Pennsylvania Democratic Party experienced pick ups in Congress, the state House, and state Senate. Although they remain in the minority in the state House and Senate, the gains made in the southeastern region of the state was often trumpeted throughout Friday night. State Rep. Margo Davidson (D-Delaware), House Democratic Southeast Delegation Chairwoman, centered her speech around breaking barriers, but clearly laid the blame at the President for a number of the issues facing various communities. “Breaking barriers is not easy, but we have to break barriers anyway,” Davidson said, referring to women and others being elected to office. The lone speaker of the evening who did not address Trump by name, but pleaded with everyone in attendance to help women candidates was state Sen. Lindsey Williams (D-Allegheny). She asked everyone in attendance to donate even just $5 to a campaign of a woman candidate they believe in. Blake named a number of Democratic elected women in positions of leadership across the country and thinks the party will only benefit if that is continued. He said multiple times to “never doubt our women” and echoed this sentiment, while detailing that allegations from women should be believed. Neither Blake nor any of the speakers mentioned state Sen Daylin Leach (D-Montgomery), who presents the party and his caucus with a test of their “believe women” mantra. Leach has been accused of multiple allegations of impropriety, including of sexual assault, was recently asked by his county party, in addition to calls from Gov. Tom Wolf and Lt. Gov. John Fetterman, to resign from office. The Senate Democrats have launched an investigation into the recent sexual assault investigation. Leach has denied these allegations and responded with a defamation suit against the accuser. Former state party chair Marcel Groen was ousted after many party members found his response to Leach wanting. Blake, who described himself as a feminist, lauded the work of Democratic women today and in the past, but also noted the work of New Zealand Prime Minister Jacinda Ardern and her response to the recent terrorist attack in Christchurch, at Al Noor mosque and the Linwood Islamic centre, that resulted in at least 50 deaths. The party remained rather united throughout the weekend, although a member of Bradford County voiced his concern that the party didn’t have Pennsylvania 12th Congressional candidate, Marc Friedenberg address the dinner. State Chair Nancy Patton Mills explained that none of the candidates for office spoke, which included candidate for the 41st state Senate district Susan Boser, who was in attendance, and she looks forward to having him address the crowd if he is elected in the upcoming special election on May 21. It was also mentioned on the floor today that the DNC is considering Pittsburgh as a location to host one of the Democratic primary debates. Will be interesting to see if Tarsi stays in. Tough to beat two women from Western PA. These women will also get the second slot votes in Philadelphia and SEPA. Unless the party has gotten stronger, the endorsement will not necessarily overcome geography and gender. Though I imagine McCaffrey will outspend the others by a large margin. I think Tarsi got out for Conor Lamb after the redistricting, so why should she get out now? If she is on the ballot, the hard work is over. When is the Republican Committee meeting so I can congratulate them and offer all my supports? Also, I’m the bestest. Vote for me! Also congrats to mes for being awesome and always winning! congrats Dan McCaffery and Amanda Green Hawkins on winning the race for the democratic side tonight and I will wish you guys a good luck on winning this race in November. 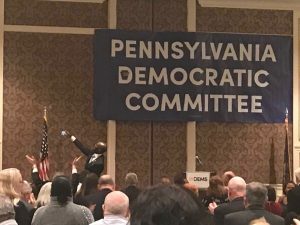 Great job by the PA Dems! Endorsing another Philadelphia corruption dynasty and an attorney that’s not even recommended by the PA Bar Association speaks right to their strengths! Corruption? Dan McCaffery served in the First Cavalry Division, attended West Point Prep School where character development is job one, and has served honorably as an Assistant District Attorney and Judge of Common Pleas with an outstanding record. He is highly recommended by his peers. Amanda Green-Hawkins non recommendation needs to be read in full for complete context. Her peers lauded her case work on the federal level and her client representation , their issue was on the state level. Support who you want sir, but doing so by scurrilous attacks not only diminishes you but those you support. Just goes to show how ridiculous the PBA ratings are. Megan King on the Republican side has zero experience in civil law and is an Assistant DA. How could she have possible received a recommended rating. She has about as much experience as a recent law school grad. A total joke. Would agree. Have majority on PA Supreme Court by a 5-2 margin, on verge of taking over Superior Court after going 4-1 in previous five races. Just admit that you’re a hillbilly who hates Philadelphia because it’s not white enough for you.